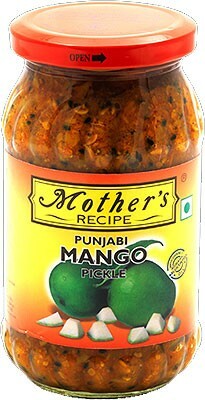 Buy Indian Mango Pickles and Relishes Online at iShopIndian.com! 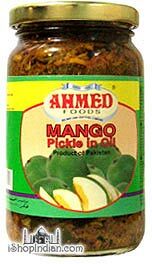 A traditional Pakistani mango pickle made with peeled, green sour mangoes mixed with spices and preserved in oil. 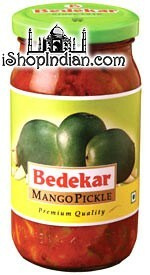 Bedekar Mango Pickle is made from High Quality "Rajapuri" Raw Mangoes. It is cured by traditional methods along with Spices & Oil. It gives truly traditional taste & great flavour to the pickle. 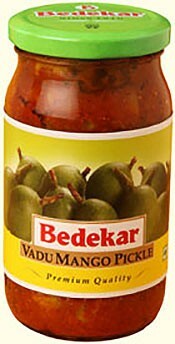 Bedekar Vadu Mango Pickle is a South Indian style Pickle. It is made from Whole/Raw tender Mangoes. 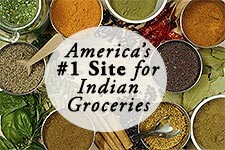 Seasame Seed Oil & typical spice blend is used to get unique tasty, South Indian Pickle. It is cured by treaditional methods alongwith Spices & Oil. It gives truly traditional taste & great flavour to the pickle. Mast mango pickle from sonar Bangla. Traditional “Panch Phoran”- 5 spices work their magic on choice mango pieces to give this pungent hot-n-sweet mango delight. 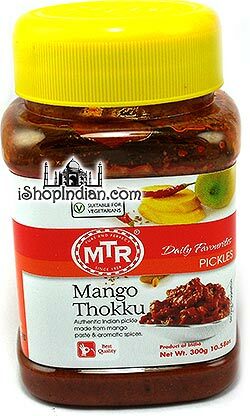 Mango pieces, sugar, Brine (Edible common salt, Acidity regulator (INS-260) ) Edible vegetable oil, Spices & Condiments& Asafoetida. $4.99 Notification will be sent to your e-mail address every time the item price is decreased. 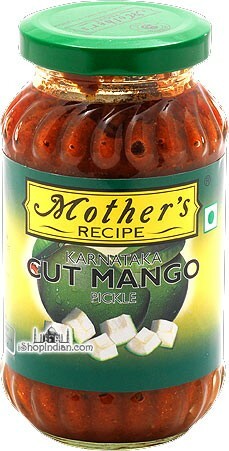 Cut Mango - From the land of Maharajahs, a tribute to the king of fruits! 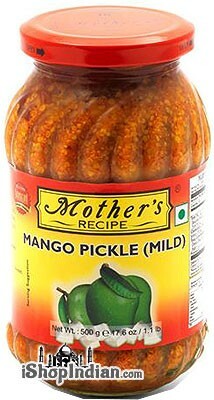 A fiery mango pickle in sesame oil with the tongue-tingling tang of methi (fenugreek). Seasoned to perfection with mustard seeds, Cumin and hing. From the Malabar Coast comes this Mango pickle which thrives on chili powder & spices. 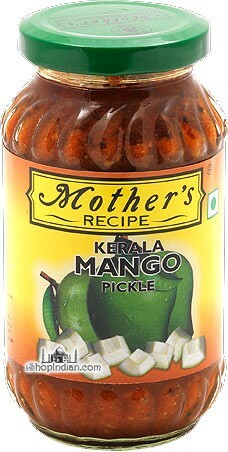 The flavor seeps into the cut mangoes ensuring the typical Malayali biting pungency. A pickle from god’s own country. Delicate Tender Kanni mangoes pickled in time and traditionally cured for the right bite! Then spiced to perfection. 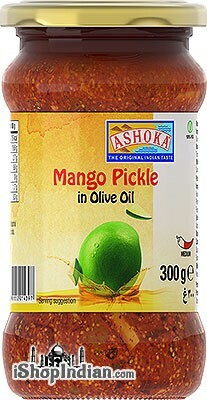 Mango pieces (66%), Salt, Cottonseed oil, Spices (Mustard, Chilli, Fenugreek, Turmeric, Asafoetida) and Acetic acid as Acidity regulator (E 260). Allergen Information – This product contains mustard. Try a spoonful of this delight pickle. Bite into luscious pieces of mango, mixed with select spices. And enjoy that special mango taste, right through the year. Ingredients: Mango pieces (60%), Salt, Cottonseed oil, Water, Spices (Mustard, Chilli, Fenugreek, Turmeric, Cumin, Coriander, Asafoetida) and Acetic acid as Acidity regulator (E 260). Allergen Information – This product contains mustard. Ingredients: Mango pieces (61%), Salt, Cottonseed oil, Water, Spices (Mustard, Chilli, Fenugreek, Turmeric, Cumin, Coriander, Asafoetida) and Acetic acid as Acidity regulator (E 260) Allergen Information – This product contains mustard. Savor an age–old recipe of crunchy unpeeled mangoes seasoned in exotic spices and bring that delicious Punjabi touch to everyday meals. 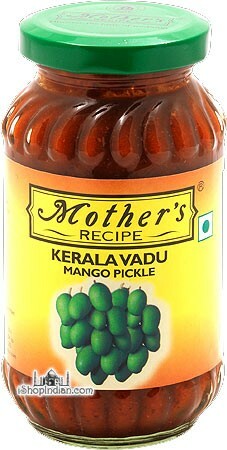 Ingredients: Mango pieces, salt, mustard oil, cottonseed oil, spices and acetic acid. 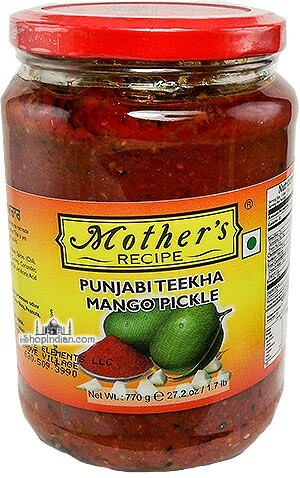 Succulent mangoes combined with other ingredients to recreate the exotic flavor of authentic Punjabi Teekha achar. This is yet another example of Mother’s genius of pickle. Ingredients: Mango pieces (53%), Salt, Water, Spices (Chilli, Fenugreek, Fennel, Mustard, Kalonji, Coriander, Turmeric, Asafoetida), Cottonseed oil, Mustard oil and Acetic acid. Allergen Information – This product contains mustard & mustard oil. Shredded mangoes embellished with fenugreek and chilly powder. Then enriched with mustard seeds, cumin and hing to give a special tang. The crowning glory: final seasoning is completed during bottling. Authentic Andhra style pickle made from chunks of mango and aromatic spices like red chili, mustard, garlic, fenugreek, cumin, sugar, curry leaves, asafoetida, turmeric and acetic acid. 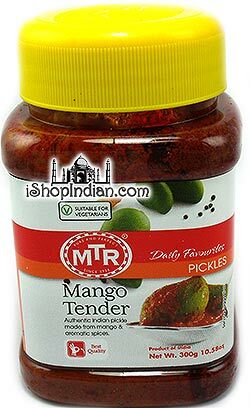 Tender Mango pickle is made with special small green mangoes that are extremely soft and tender. 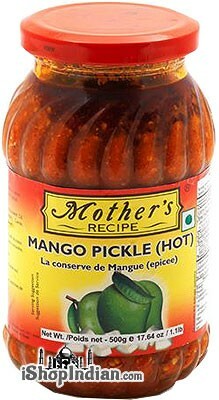 This pickle contains 70% tender mango, salt, red chilli, mustard powder, turmeric powder, asafoetida and acetic acid. 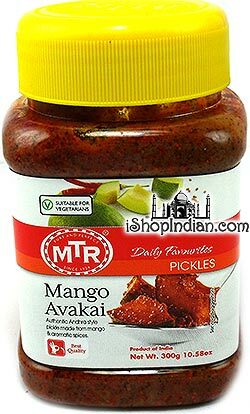 Authentic Indian pickle made from green mango paste, sesame oil and aromatic spices such as red chili powder, mustard, cumin powder, fenugreek powder, asafoetida, turmeric powder and acetic acid. 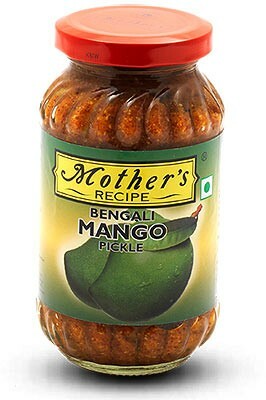 A sweet mango pickle made with shreds of green mangoes and sugar. This is a specialty condiment mostly relished by West Indians. 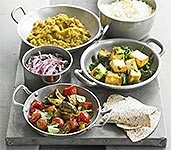 Enjoy with Kheechri (rice and lentil porridge) and hot Indian flatbreads. $6.99 Notification will be sent to your e-mail address every time the item price is decreased. 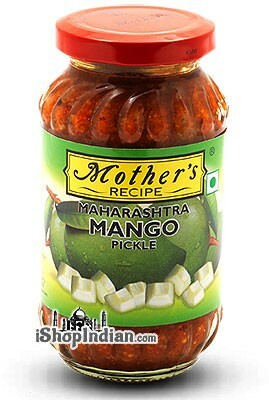 Chunks of sour green mangoes mixed with a finger-licking combination of pungent spices. $5.99 Notification will be sent to your e-mail address every time the item price is decreased.